Jean-François Raffaëlli (1850-1924), The Abandoned Road (1904), oil on canvas, 155 x 188 cm, Museo Nacional de Bellas Artes, Buenos Aires, Argentina. Wikimedia Commons. One of the frequent points of friction between Degas and most of the other Impressionists was his choice of artists to include in the movement and its exhibitions. As I have explained with respect to the First Impressionist Exhibition of 1874, many of those who showed their work there had no prior or subsequent connections with Impressionism. The one artist who epitomised these issues was a friend of Degas, Jean-François Raffaëlli (1850-1924). Born in Paris but of Italian descent, he started to paint seriously in 1870 and had a landscape painting accepted for the Salon of that year. The following year he undertook just three months of study under Jean-Léon Gérôme, which formed his only training. Jean-François Raffaëlli (1850-1924), The Ragpicker (1879), oil on panel, 77 × 69 cm, location not known. Wikimedia Commons. 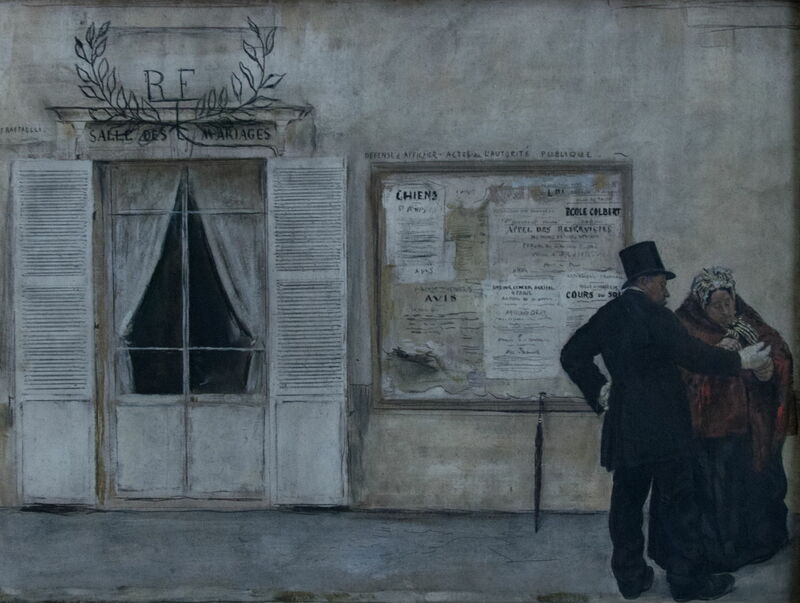 During the mid-1870s, Raffaëlli started painting the poorer residents of Paris and its surrounds. 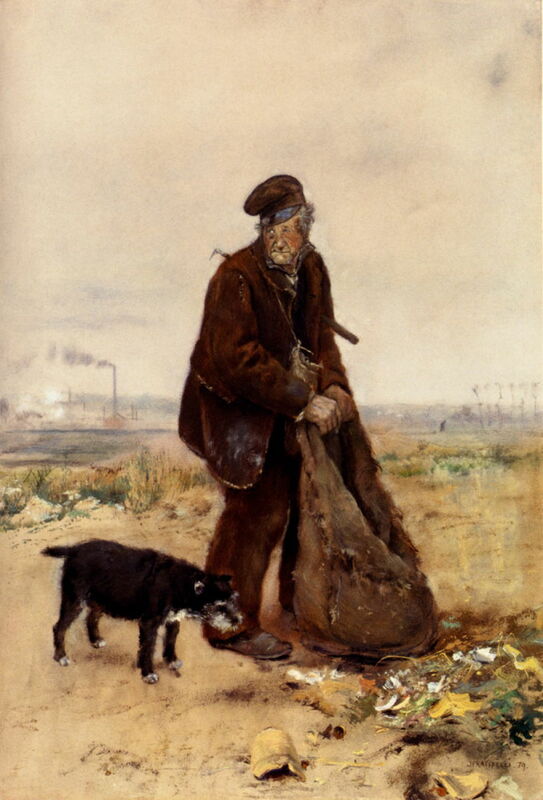 The Ragpicker (1879) was a great success, and his work was promoted by the influential critic Joris-Karl Huysmans. At about this time, he joined Degas’ circle, and the latter helped his career and repeatedly tried to bring him into the Impressionist movement and its exhibitions. Jean-François Raffaëlli (1850-1924), Man with Two Loaves of Bread (1879), further details not known. Wikimedia Commons. 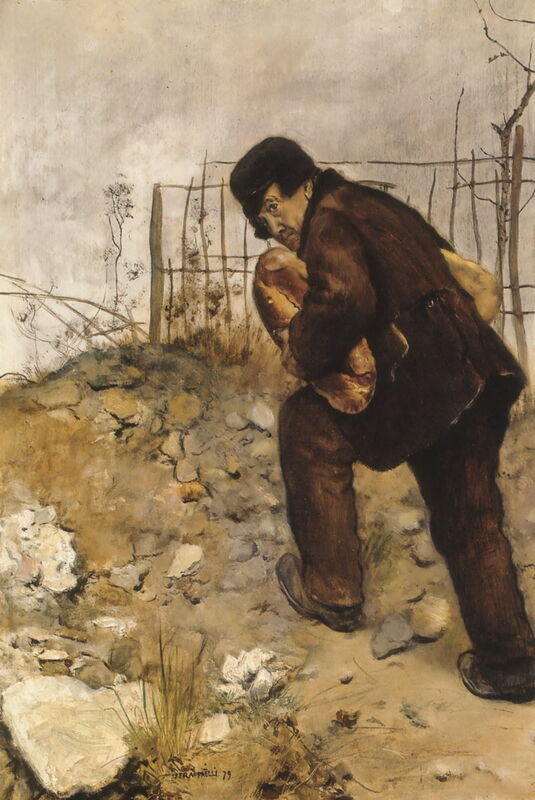 Man with Two Loaves of Bread (1879) is another painting from Raffaëlli’s series of social realist works. Jean-François Raffaëlli (1850-1924), The Absinthe Drinkers (c 1880-81), further details not known. Wikimedia Commons. 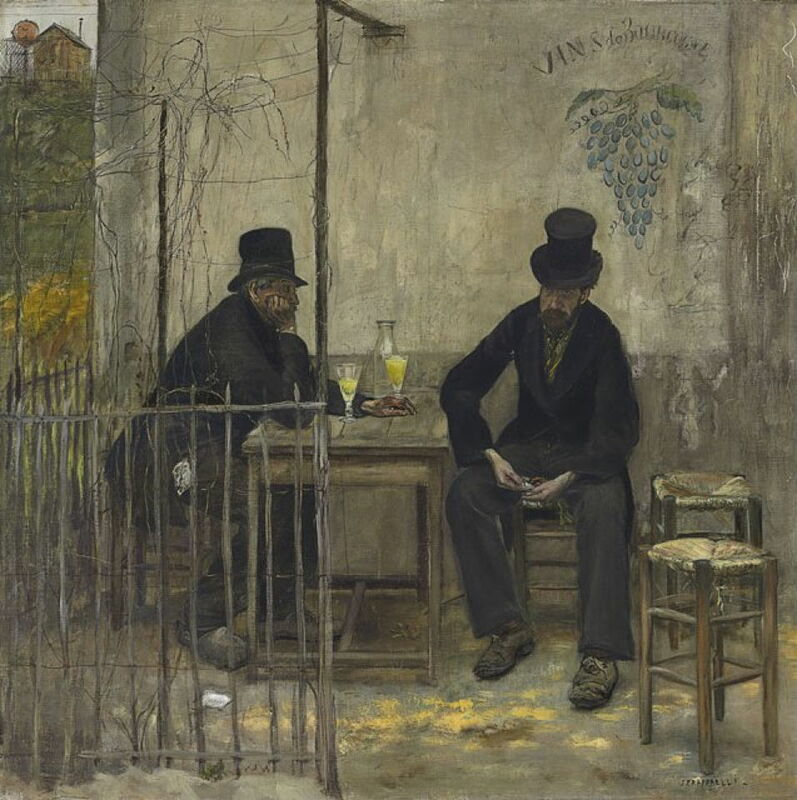 In his The Absinthe Drinkers (c 1880-81) he followed from Manet’s first major painting of about 1859, and a theme which Degas had also painted in 1875-76. Degas’ version had met with a very hostile reception, and at this time was being stored. Raffaëlli had threatened to overwhelm the work of the ‘real’ Impressionists at their exhibition in 1880, when he showed thirty-seven works, and forced Monet to withdraw altogether in response. Raffaëlli’s The Absinthe Drinkers was exhibited the following year, when it was one of the few works to attract widespread critical approval. Jean-François Raffaëlli (1850-1924), Guests Waiting for the Wedding (before 1884), oil on panel, 52.5 x 68.5 cm, Musée d’Orsay, Paris. Wikimedia Commons. Guests Waiting for the Wedding (before 1884) also seems to have been well-received. 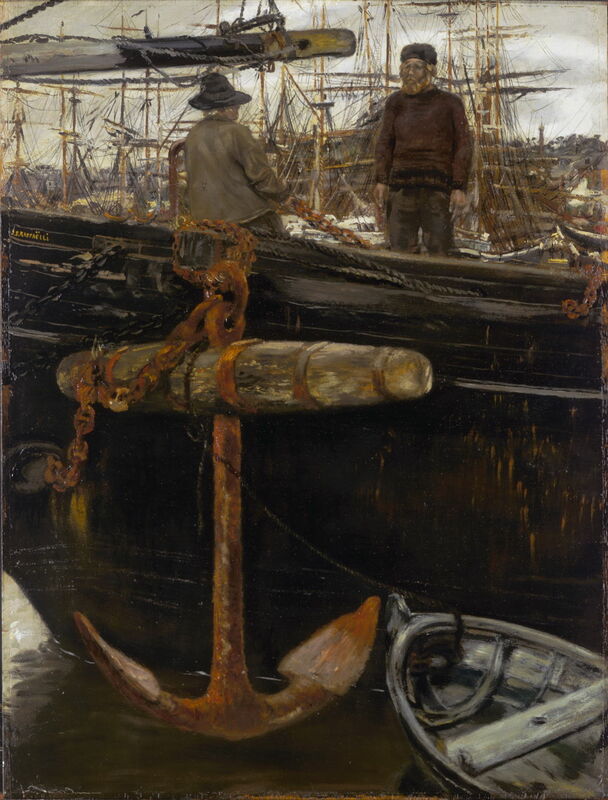 Jean-François Raffaëlli (1850-1924), Sailors from the North (date not known), oil on wood, 68 x 53 cm, Nationalmuseum, Stockholm, Sweden. Wikimedia Commons. Raffaëlli’s undated Sailors from the North confirms his realist style. Jean-François Raffaëlli (1850-1924), Old Woman in the Snow (date not known), oil on canvas, 239 × 95 cm, Museo Nacional de Bellas Artes, Buenos Aires, Argentina. Wikimedia Commons. Although Old Woman in the Snow is also undated, I suspect that it came from this period of social realism. 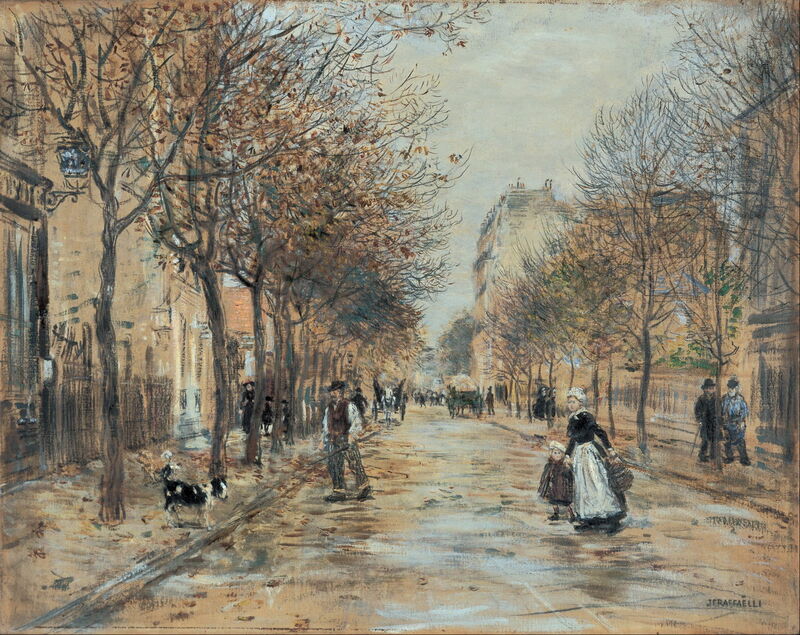 Jean-François Raffaëlli (1850-1924), The Outskirts of Paris (c 1880-90), oil, dimensions not known, Niedersächsisches Landesmuseum Hannover, Hanover, Germany. Image by Hajotthu, via Wikimedia Commons. 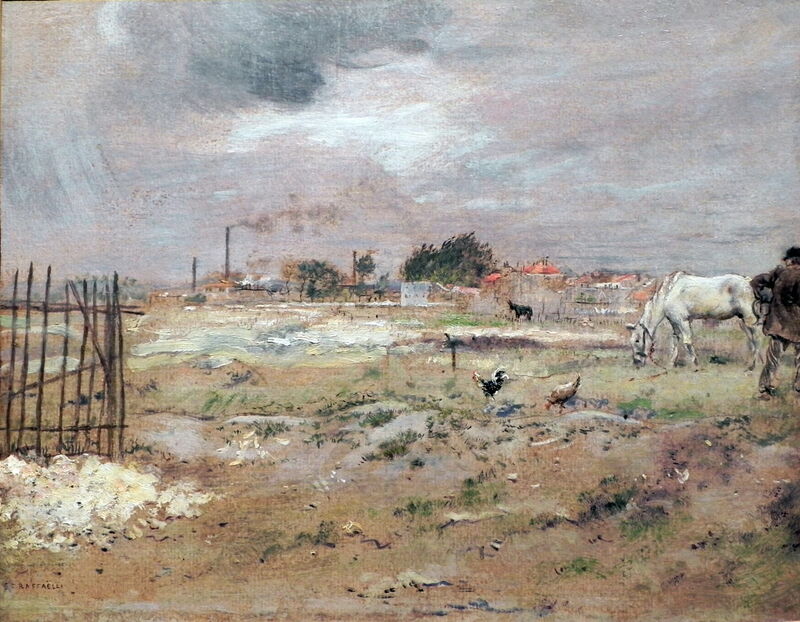 During the 1880s, Raffaëlli’s style moved on, and in some respects became more Impressionist, as shown in this more painterly view of The Outskirts of Paris (c 1880-90). Jean-François Raffaëlli (1850-1924), At the Caster’s (1886), oil on canvas, 128 x 116 cm, Musée des Beaux-Arts, Lyon, France. Wikimedia Commons. 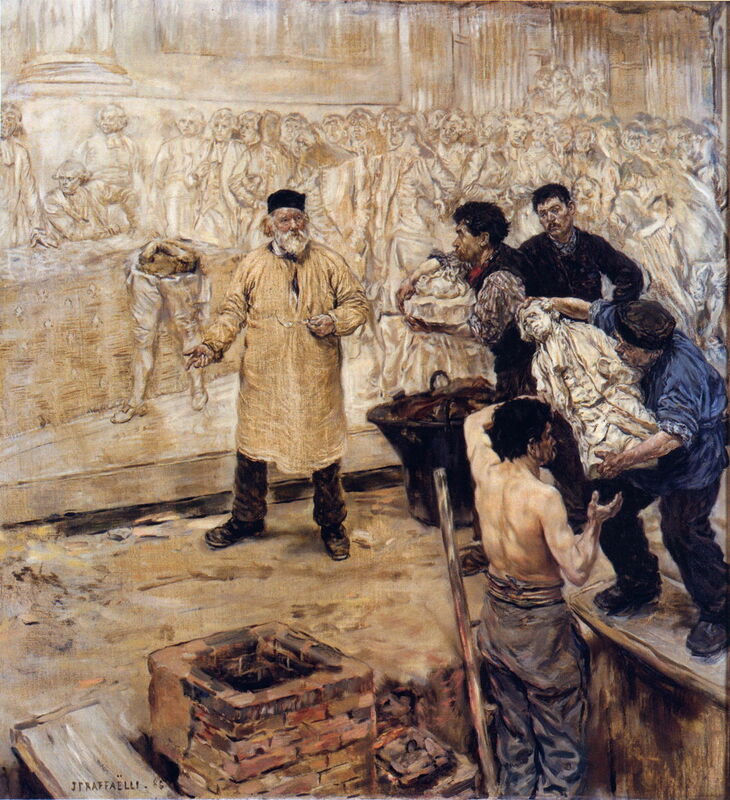 At the Caster’s (1886) is a detailed depiction of work being undertaken by Eugène Gonon to cast a relief, which had been exhibited as a plaster cast at the Salon of 1883. The resulting bronze is now at the Palais Bourbon in Paris. Raffaëlli was also a sculptor, although little if any of his sculpture seems to have survived. 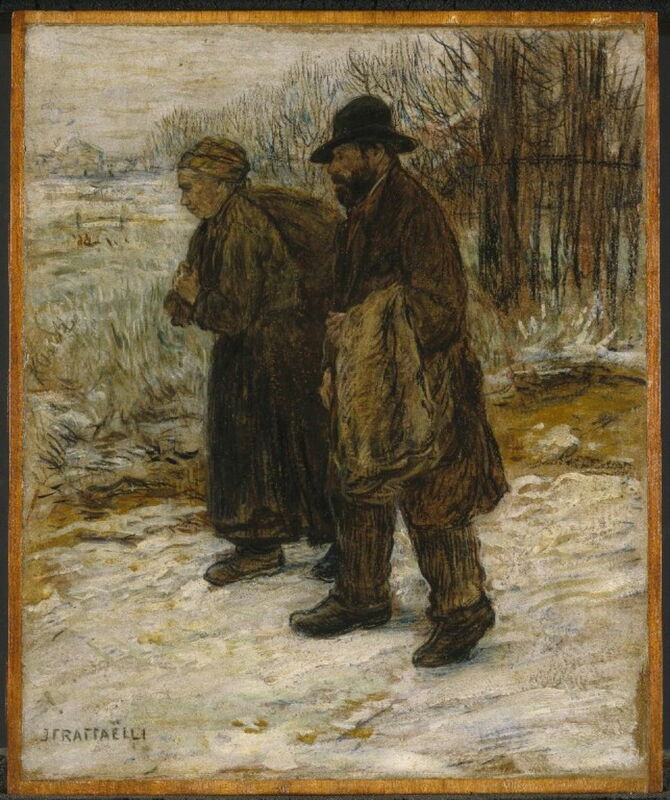 Jean-François Raffaëlli (1850-1924), Parisian Rag Pickers (c 1890), oil and oil crayon on board set into cradled panel, 32.7 × 27 cm, Brooklyn Museum, New York, NY. Wikimedia Commons. Raffaëlli also became more experimental in his choice of media: this version of Parisian Rag Pickers from about 1890 was made using mixed media of oil paints and oil crayons. 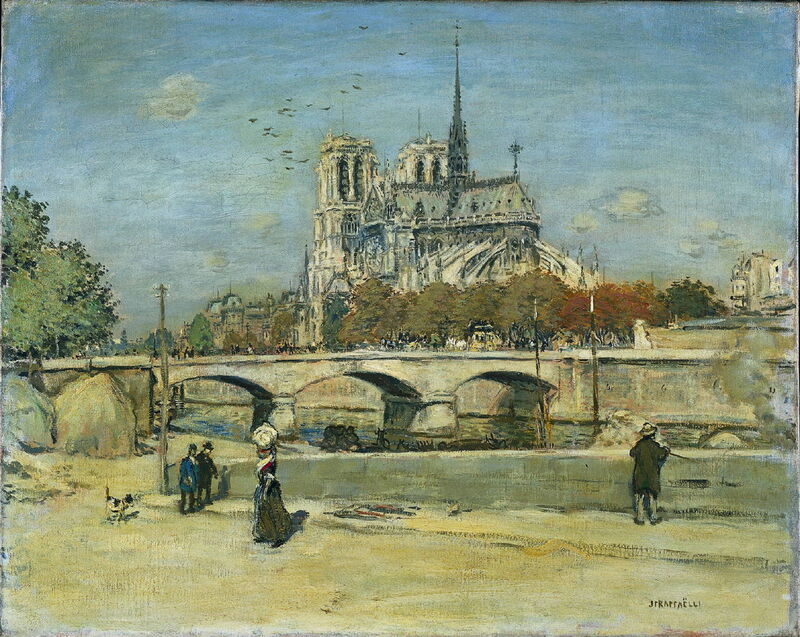 Jean-François Raffaëlli (1850-1924), Notre-Dame de Paris (1890-95), media and dimensions not known, Art Institute of Chicago, Chicago, IL. Wikimedia Commons. From about 1890, though, Raffaëlli concentrated on paintings of Parisian street scenes, such as his Notre-Dame de Paris (1890-95), and in print-making, although I have not been able to locate any of his prints. Jean-François Raffaëlli (1850-1924), The Fletcher Mansion, New York City (1899), oil on canvas, 60.3 x 81.3 cm, Metropolitan Museum of Art, New York, NY. Wikimedia Commons. 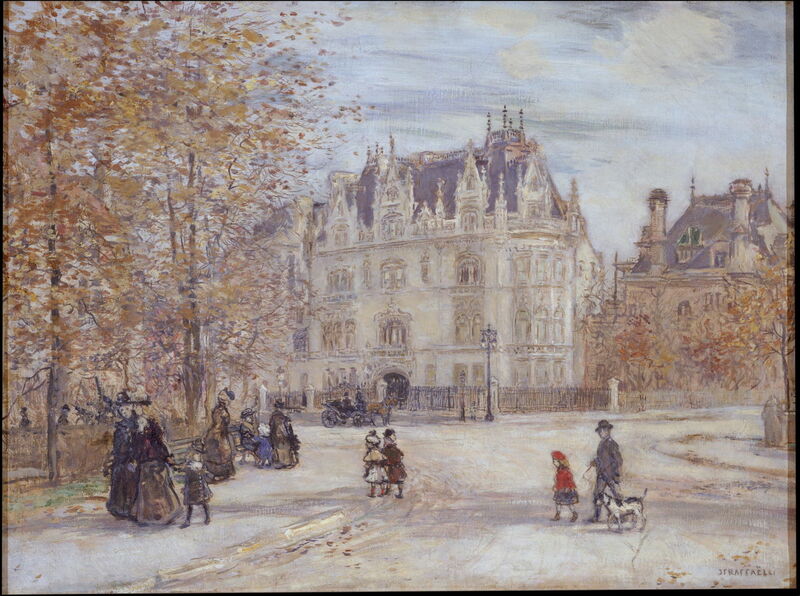 Raffaëlli’s painting of The Fletcher Mansion, New York City from 1899 must have been painted during Raffaëlli’s second visit to the US, when he served on the jury of the Carnegie International Exhibition in Pittsburgh in 1899. The mansion was the private residence of Isaac D Fletcher and his family, and stood on the southeast corner of Fifth Avenue and 79th Street. The building was only completed in 1898. 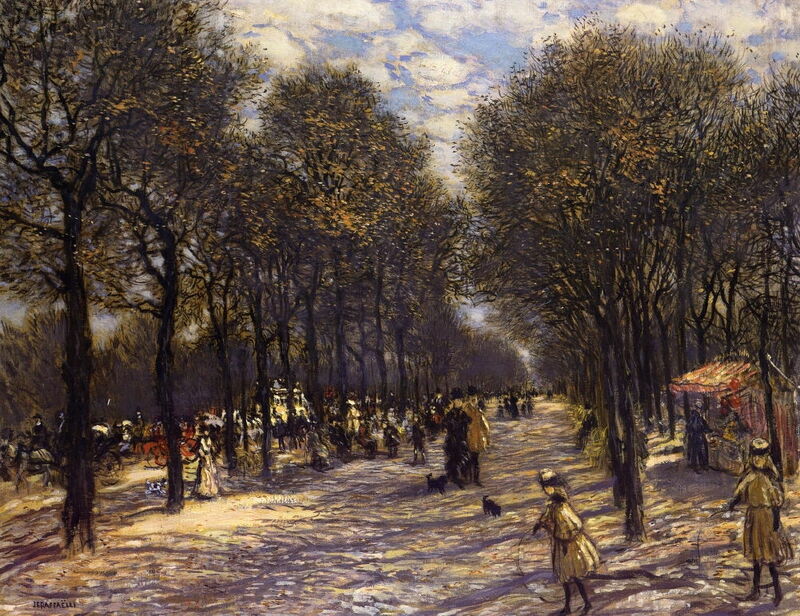 Jean-François Raffaëlli (1850-1924), Les Champs-Elysées (c 1900), further details not known. Wikimedia Commons. 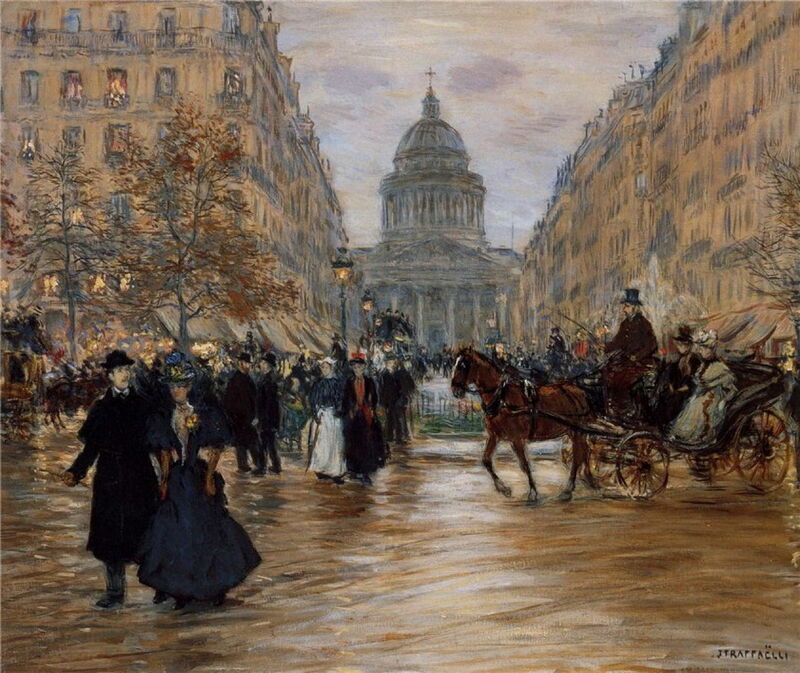 Around the turn of the century, Raffaëlli’s style became more painterly again, and could perhaps be termed Impressionist, as shown in his Les Champs-Elysées (c 1900). Jean-François Raffaëlli (1850-1924), Notre Dame Seen from the Quai de la Tournelle (c 1897-1902), oil on fabric, 65 × 81.2 cm, Cleveland Museum of Art, Cleveland, OH. Wikimedia Commons. 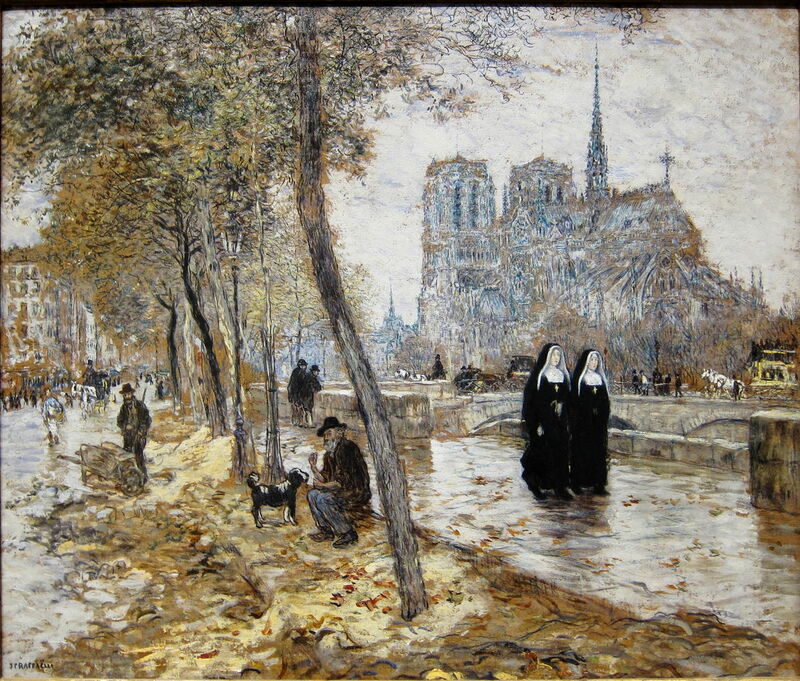 Raffaëlli still kept quite fine detail in this view of Notre Dame Seen from the Quai de la Tournelle (c 1897-1902). 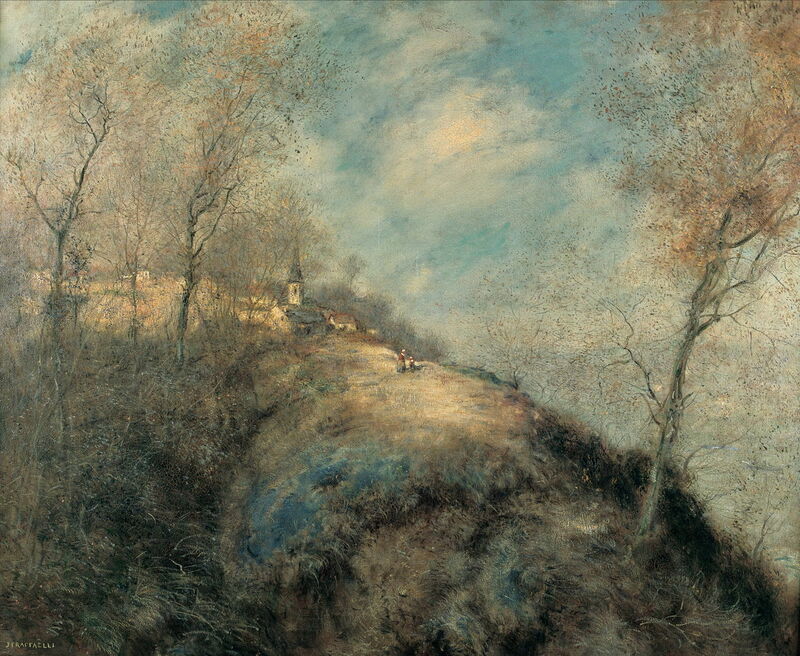 The Abandoned Road (1904) is, to my eye, one of Raffaëlli’s finest paintings, showing where an old road running along the top of a sea cliff had been lost in a large landslip. The whaleback ridge in the foreground has an almost animal feel to it, and his use of figures and the small village gives the scene a grand scale. 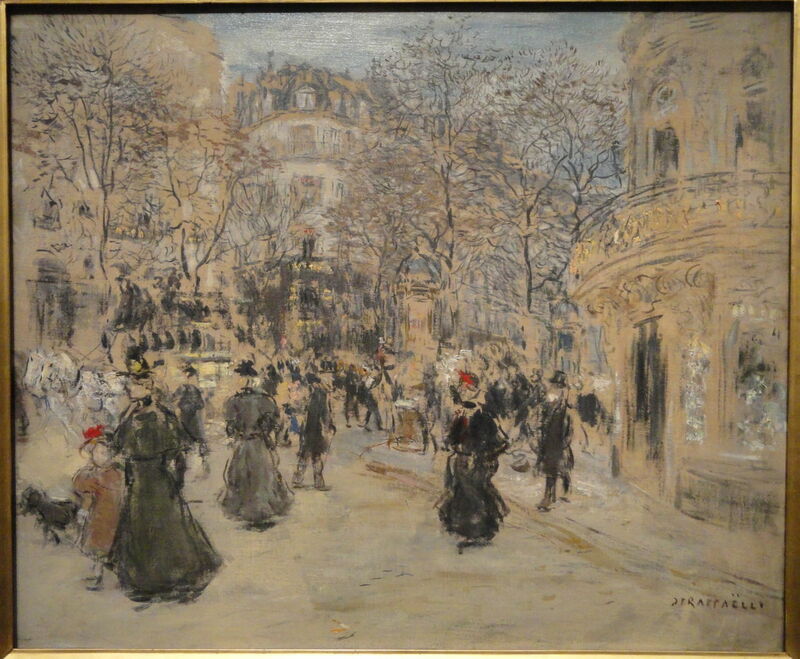 Jean-François Raffaëlli (1850-1924), The Boulevard (Italiens) (c 1900-05), media and dimensions not known, Corcoran Gallery of Art, Washington, DC. Image by Daderot, via Wikimedia Commons. The Boulevard shows the Boulevard des Italiens in Paris, and probably dates from 1900-05. His style is here at its loosest, with the figures made very gesturally, and details of buildings appear to have been sketched briskly. Jean-François Raffaëlli (1850-1924), Street in Asnières (date not known), oil on canvas, 55.9 x 71 cm, Ohara Museum of Art 大原美術館, Kurashiki, Japan. Wikimedia Commons. This painting of a Street in Asnières was probably made at about this time. Asnières has now been swallowed up as a suburb of Paris, to the north-west, and sits on the north bank of the River Seine. Jean-François Raffaëlli (1850-1924), The Water’s Edge in Spring (1909), oil on canvas, dimensions not known, Musée des Beaux-Arts Jules Chéret de Nice, Nice, France. Image by Finoskov, via Wikimedia Commons. 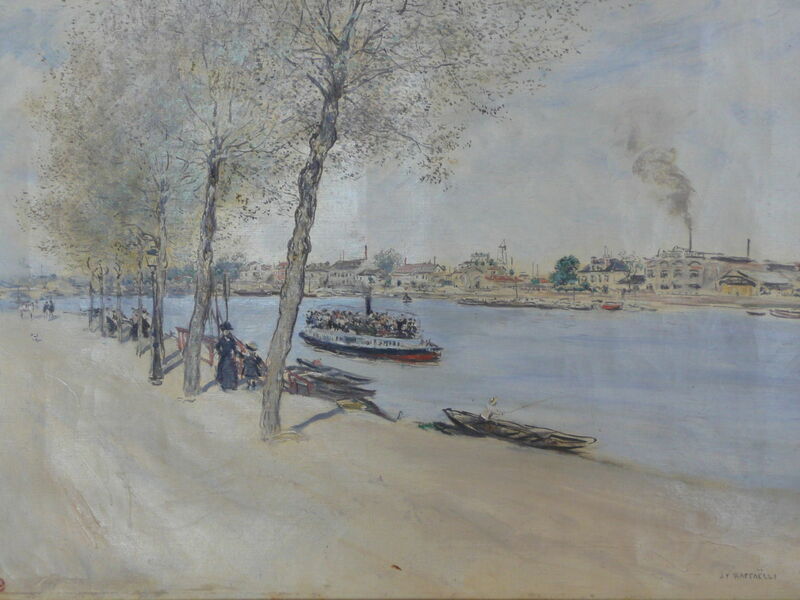 The Water’s Edge in Spring shows Raffaëlli’s sketchy style from 1909. Boulevard Saint Michel (1918) is another view of a famous street in Paris, this time in the Latin quarter near the Sorbonne and Luxembourg Gardens. In his day, Raffaëlli was successful, and his views of Paris were particularly popular. Since his death in 1924, though, his art has largely been forgotten, despite the fact that his paintings are in many major public collections throughout Europe, North and South America. Posted in General, Painting and tagged Degas, Impressionism, landscape, Manet, Monet, painting, Raffaëlli, realism. Bookmark the permalink.